Here is a delicious Greek chicken recipe for you to make. I have been able to find chicken cutlets at most markets these day. If you can not find cutlets you may simply slice a chicken breast horizontally into three flat slices. You could pound them out a little more with a meat mallet if you like. 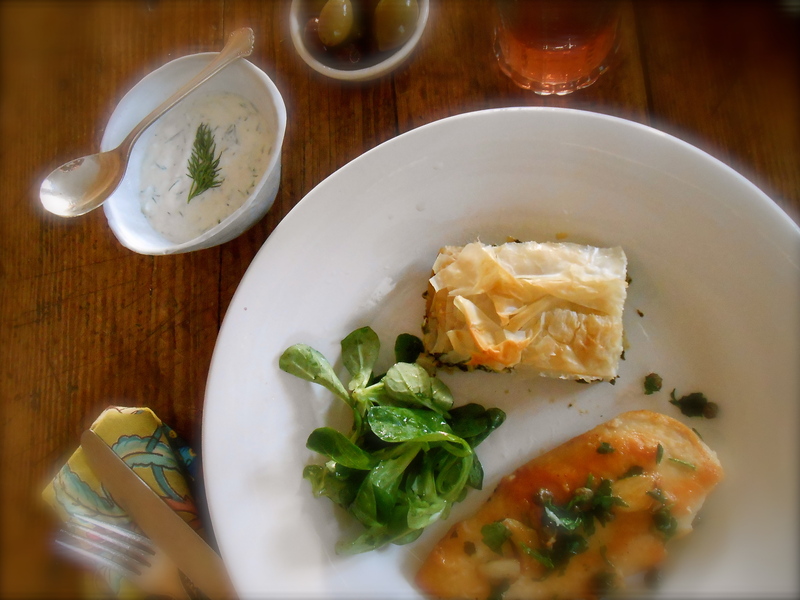 Served with tzatziki, spanokópita, mache’ salad and greek olives. Lightly pat both sides of chicken in flour. In a large skillet, heat the olive oil with the smashed garlic over medium high heat and cook until the garlic is aromatic. Add the chicken and fry until golden. Turn the chicken over, season with salt and pepper and continue to cook other side until golden. Turn again, season and squeeze in the lemon juice, add the capers, parsley and hot water. When it starts to bubble put a lid on the pan and cook for a few minutes. Turn off the heat and serve right away. Using your hands, after you peel and grate the cucumber, squeeze out the excessive juice. Place in a bowl and mix well with all the other ingredients. Taste and add salt to your liking. We are big lovers of Greek food and flavors in this house — my husband makes Spanakopita a couple time a year, and this cutlet recipe looks like a great blend of classic Greek tastes. Thank you! :) It was. I love your recipes/foods! How tasty! Great! This chicken recipe is the easiest chicken I have ever made. You will love the flavor. Looks so delicious. 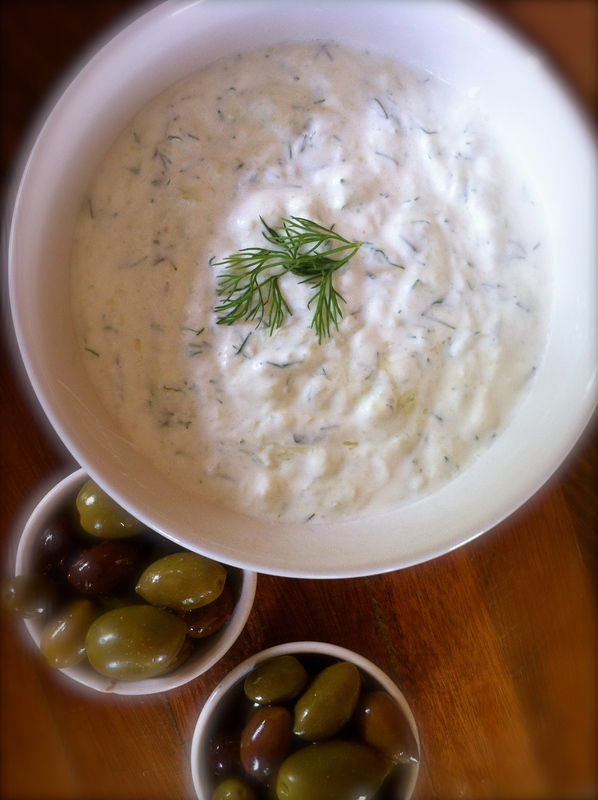 I love, love, love tzatziki! Me too! I love tzatziki too! When things are kept simple the ingredients shine. Another yummy looking recipe, thank you! What a nice “saying”. Thank you. I just love Greek food. Your tzatziki looks delicious! And is that your spanikopita I see on your plate?? Mmmmm! Mmmmmmm this looks amazing! I’ve always wanted to try my hand at spanikopita!! And you should… it is fairly easy. So delicious homemade! Thank you for your comment. I know exactly what you mean. I love slow cooking on the weekends, with no time restraints whatsoever! It’s funny how our lives become so busy. I hardly even find time for those experiences on the weekend these days. Hm, I think I might start booking ‘slow cooking Saturday’ into my diary as a proper commitment ;) Thanks for the inspiration! Slow Cooking Saturday….sounds like a book title. Have a great weekend! You are currently reading greek chicken cutlets and tzatziki at COTTAGE GROVE HOUSE.